Mani Ratnam is one of the best directors in Indian cinema, with his films gaining popularity all over the country. He first was working with Ilayaraja till Thalapathi, before he launched AR Rahman through Roja. Since then, Rahman has been working on all Mani Ratnam films, till the recent release Chekka Chivantha Vaanam, and they've never failed to create magic. While the songs of his films, turn out to become big hits because of Rahman, he makes them look aesthetic and beautiful on screen. One of such songs that the duo churned out was Pudhu Vellai Mazhai from Roja. 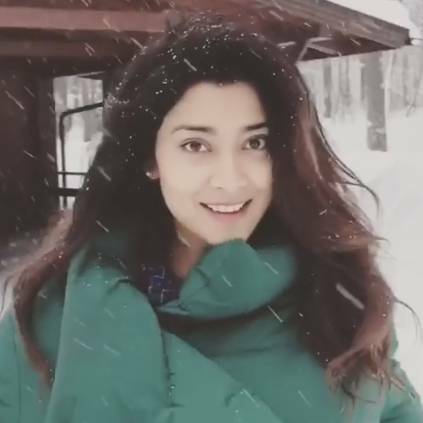 Actress Shriya Saran recently posted a video on Instagram, that had her at a scenic location that was filled with snow. The caption of the video read: "An Indian girl stays Indian at heart ❣ forever ♾ so it’s -18 and all I can think of is ‘yeh Haseen Vaidya, ye khula asama ‘ #manirathnam"
People looking for online information on AR Rahman, Arvind Swami, Madhoo, Mani Ratnam, Pudhu Vellai Mazhai, Roja, Shriya Saran will find this news story useful.